I get many emails from folks that are interested in all things having to do with roses, from the care of roses to diseases of roses, rose foods or fertilizers and even how various roses are created. One of my recent email questions concerned a process called “stenting.” I had not heard of the term before and decided it was something I needed to learn more about. There is always something new to be learned in gardening, and here is more information on rose stenting. Propagating rose bushes through stenting is a quick process that comes from Holland (Netherlands). Stemming from two Dutch words – “stekken,” which means to strike a cutting, and “enten,” which means to graft – rose stenting is a process where the “scion” (a young shoot or twig cut for grafting or rooting) material and rootstock are joined together before rooting. Essentially, grafting the scion onto an under stock then rooting and healing the graft and rootstock at the same time. This type of graft is thought not to be as strong as a traditional field budded plant, but it seems to suffice for the cut flower industry of the Netherlands. Plants are created, grown very fast and lend themselves to the hydroponic type systems that are used in cut flower production, according to Bill De Vor (of Green Heart Farms). Once a rose bush has gone through all the testing that is required to be sure it is truly a rose good enough to send to market, there is the need to come up with several of the same. After contacting Karen Kemp of Weeks Roses, Jacques Ferare of Star Roses and Bill De Vor of Greenheart Farms, it was determined that here in the United States tried and true methods of producing several roses for market are the best to ensure quality rose bushes. Bill De Vor stated that his company produces about 1 million miniature roses and 5 million shrub/garden roses a year. He estimates that there are about 20 million field grown, budded bare root roses being produced annually between California and Arizona. A hardy rose, named Dr. Huey, is used as the under stock (the hardy root stock that is the bottom part of the grafted rose bushes). In early reports as to why the famous Knockout roses fell victim to the Rose Rosette Virus (RRV) or Rose Rosette Disease (RRD), one of the reasons given was that the production of more roses to get them to the demanding marketplace became too rapid and things got sloppy in the overall process. 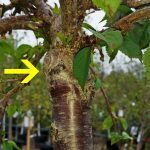 It was thought that perhaps some dirty pruners or other equipment may have caused the infection that led to many of these wonderful plants falling victim to this terrible disease. When I first heard of and studied the stenting process, RRD/RRV came immediately to mind. Thus, I posed the question to Mr. Ferare. His reply to me was that “in Holland, they are using the same phytosanitary protocols to produce stentlings in their greenhouses as we do here in the USA to propagate our roses on their own roots. Rose Rosette is only spread by the eriophyid mite, not by wounds as with many diseases. The stenting process is very interesting and apparently serves its main need to the cut flower industry well. The end of the root stock is dipped into rooting hormone and planted with union and scion above the soil. After some time, roots begin forming and voila, a new rose is born! An interesting video of the process can be viewed here: http://www.rooting-hormones.com/Video_stenting.htm, as well as additional information. Learning something new concerning our gardens and the pretty bloom smiles we all enjoy is always a good thing. Now you know a bit about rose stenting and the creation of roses that you can share with others.